Look what they turned into - this is called a Split 9-Patch. The original idea is from Quiltville.com, but there are many variations arount the net, and Bonnie's version WAS my favorite, with the red/white in that position. I will keep the red/white constant, although I already ran out of that particular RED - I have others. First issue I am having is, what value should my darks be? Next issue is, 'should I go to the tans, browns, forest colors? or stick with blues, reds, etc., or shall I mix them up? This is about one hours worth of work, with strips already cut, and I DID remember to do some stretching X's between working. (clarification) This is 4 blocks together, making one 12 inch block. I'm liking it! So anxious to see your split 9 patch. Like your controlled scrappy blocks. love this block...but is the WHOLE thing 6 inches, meaning each of those squares and half square triangles finishes at 1 inch??? YIKES! I can't believe you made something that tiny with all those pieces!! I'd say mix it up. 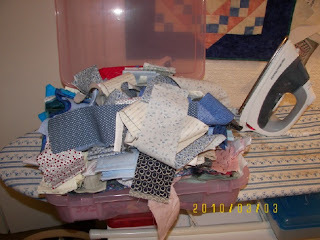 Scrap quilts should be scrappy. Now that is alot of squares but one gorgeous block! The Nine Patch Split block is our Block of the month at guild in April...Though is done a little different with two rectangles instead of all squares. Love this block. ELAINE! This is such a very cool making you have here. Wow! I love it. You're such a bounty of creative bliss, I tell ya! It looks great, and I agree that the constant reds and whites in the same position is a good idea. But wow, so many small pieces! It'll be spectacular when you're done. With the red constant, I think you can use lots of variety in your lights and darks. It will be a very striking quilt. 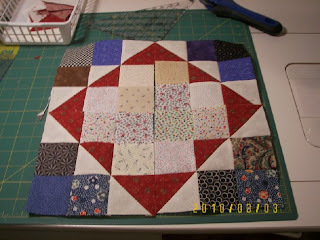 I really have been eying this project of Bonnie's...and there you are making those fun blocks!! I love it!! Great minds think alike? LOL! This is adorable. I think I would stick with red/white/blue.